We arrived last Wednesday and Mr A had to go to work the next morning at 8 am. Thankfully, the jet lag wasn’t too considerable for us, merely coming from Egypt, I would hate to do that after the complete 12 hour switch from US time. 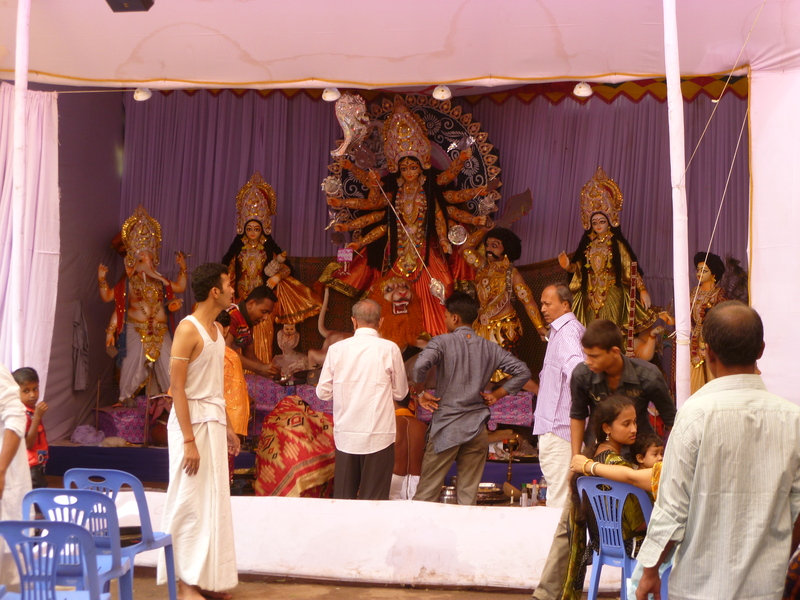 You can see the many armed "Durga" in the center. Over the weekend, we attended one of the CLO’s (Community Liaison Office) social/cultural events. We happened to arrive just in time for one of the big Hindi festivals, Durga Puja. While Bangladesh is a predominantly Muslim society (90 percent or more), there is a local Hindu minority and a bit of synchretism about the local worship. The particular village we intended to visit was about 45 km away. While in some places, such a trip might take an hour on the long side and half and hour on the average side, here in Dhaka it took us 3 hours to get there. The traffic is impressive. I’ll talk more about the traffic in another post, since it really deserves it. Essentially Durga Puja is a celebration of the victory of good over evil. After building family temples and clay statues (huge and abundantly decorated) of the main characters in the story, there are several days of festival followed by the “immersion.” We unfortunately did not get a chance to go to the actual immersion (security issues, timing issues), but I’ve seen some movies of the event. The goddess Durga, who was created of parts and weapons loaned by many good gods is returned to the river so that she can be born again to fight evil next year. The statues are paraded to the river and thrown in with tons of flowers and singing. While in the Hindu village, we got a chance to eat some local vegetarian curries, and some really tasty cinnamon biryani, all of which reminded me of my curry-eating days in the Berkeley coops. There are several things here in Dhaka that remind me of the Berkeley coops… and not just the food. There aren’t too many indulged undergrads here though, nor is the “Happy Happy” man. Dhaka probably has enough real life fire and brimstone without his sermons. The trip back from the event was much quicker, and I got a chance to see a significant portion of the city of Dhaka as we drove along some of the major thoroughfares. Everything is actually pretty close together, Dhaka’s land mass is only the size of an average US town, but it takes forever to get around because of traffic and the zany method of routing they employ to keep neighborhoods separated.